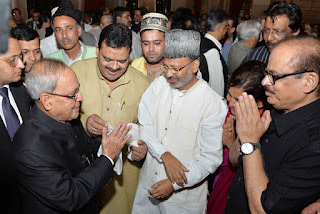 The President, Shri Pranab Mukherjee meeting the Vice President, Shri Mohd. 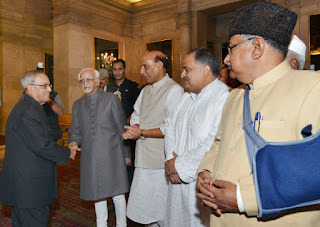 Hamid Ansari, at an Iftar party, hosted by him, at Rashtrapati Bhawan, in New Delhi on July 15, 2015. 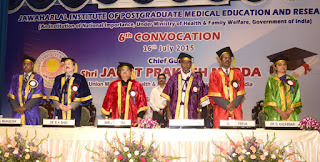 The Union Home Minister, Shri Rajnath Singh and other dignitaries are also seen. 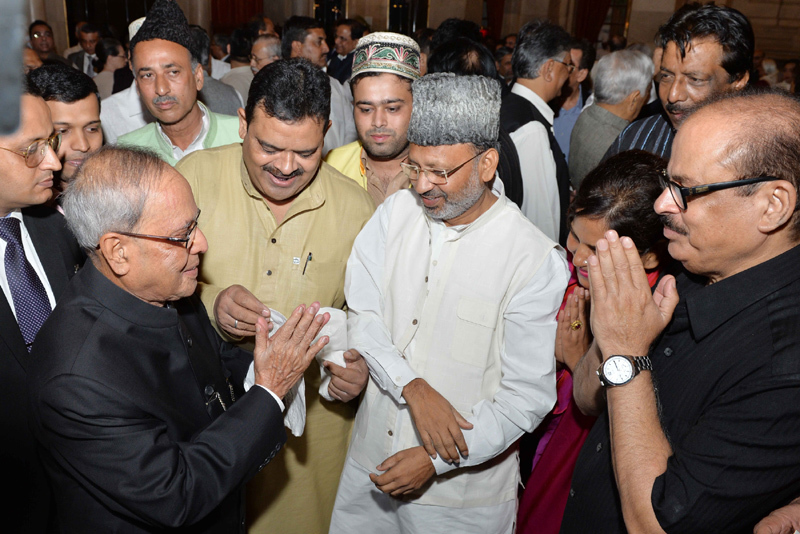 The President, Shri Pranab Mukherjee meeting the invitees, at an Iftar party, hosted by him, at Rashtrapati Bhawan, in New Delhi on July 15, 2015. 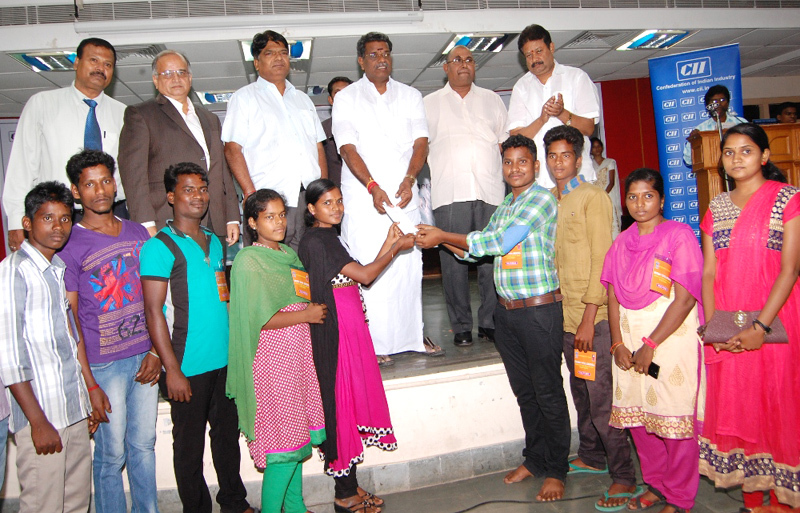 The Minister for Labour & Employment of Pudhucherry, Shri P. Rajavel distributing certificates and memento to the trainees of Skill Development, organised by the Nehru Yuva Kendra, on the occasion of the World Youth Skills Day, in Pudhucherry on July 15, 2015. 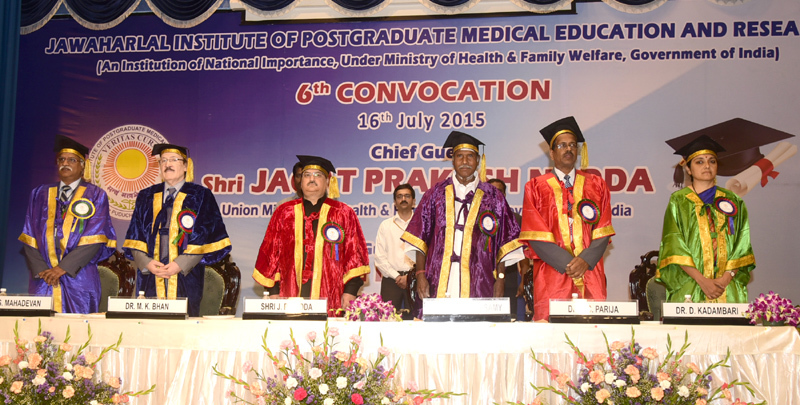 The Union Minister for Health & Family Welfare, Shri J.P. Nadda at the 6th Convocation of Jawahar Lal Institute of Post-Graduate Medical Education and Research (JIPMER), in Pudhucherry on July 16, 2015. The Chief Minister of Puducherry, Shri N. Rangasamy and dignitaries are also seen. 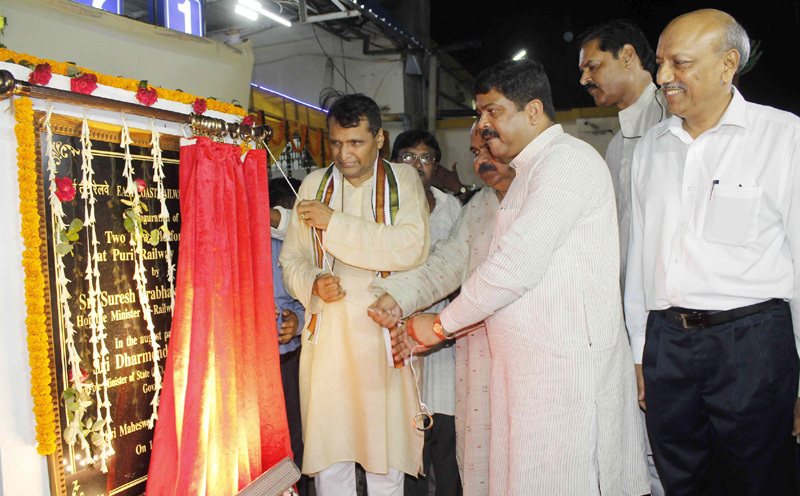 The Union Minister for Railways, Shri Suresh Prabhakar Prabhu flagging off the Khurda Road-Begunia Passenger train in the newly built section, at Begunia, in Odisha on July 16, 2015. The Minister of State for Petroleum and Natural Gas (Independent Charge), Shri Dharmendra Pradhan and the Parliament members, Shri Pyarimohan Mohapatra and Shri Prasanna Patsani are also seen. The Union Minister for Railways, Shri Suresh Prabhakar Prabhu and the Minister of State for Petroleum and Natural Gas (Independent Charge), Shri Dharmendra Pradhan during their visit to the Puri Railway Station, in Odisha on July 16, 2015. The Minister of State for Finance, Shri Jayant Sinha being presented a memento by the Director of CBI, Shri Anil Sinha, at the inauguration of the 6th Conference of Chief Vigilance Officers of Public Sector Banks & Financial Institutions and CBI, organised by the Central Bureau of Investigation, in New Delhi on July 17, 2015. 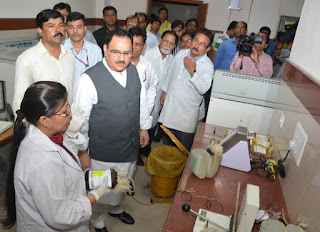 The Union Minister for Health & Family Welfare, Shri J.P. Nadda visiting the Blood Bank and Transfusion Unit, during his visit to Safdarjung Hospital, for surprise inspection, in New Delhi on July 17, 2015. The Union Minister for Mines and Steel, Shri Narendra Singh Tomar handing over the detailed exploration reports of 28 mine blocks to the Chief Minister of Rajasthan, Smt. Vasundhara Raje, in Jaipur on July 16, 2015. A delegation of Ministers and MLAs from Nagaland led by the Speaker of Nagaland Legislative Assembly, Shri Chotisuh Sazo and the Chief Minister, Nagaland, Shri T.R. Zeliang, calling on the Union Home Minister, Shri Rajnath Singh, in New Delhi on July 17, 2015. The Union Home Secretary, Shri L.C. Goyal, the Interlocutor for Naga peace talks and Chairman, Joint Intelligence Committee, Shri R.N. Ravi and the Joint Secretary (NE), MHA, Shri Shambhu Singh are also seen. The Prime Minister, Shri Narendra Modi being welcomed by the Governor of Jammu and Kashmir, Shri N.N. 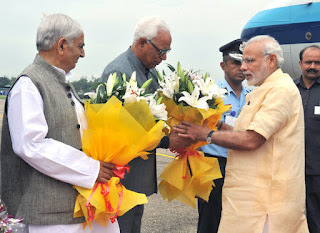 Vohra and the Chief Minister of Jammu and Kashmir, Shri Mufti Mohammad Sayeed, on his arrival, at Jammu Airport, in Jammu and Kashmir on July 17, 2015. 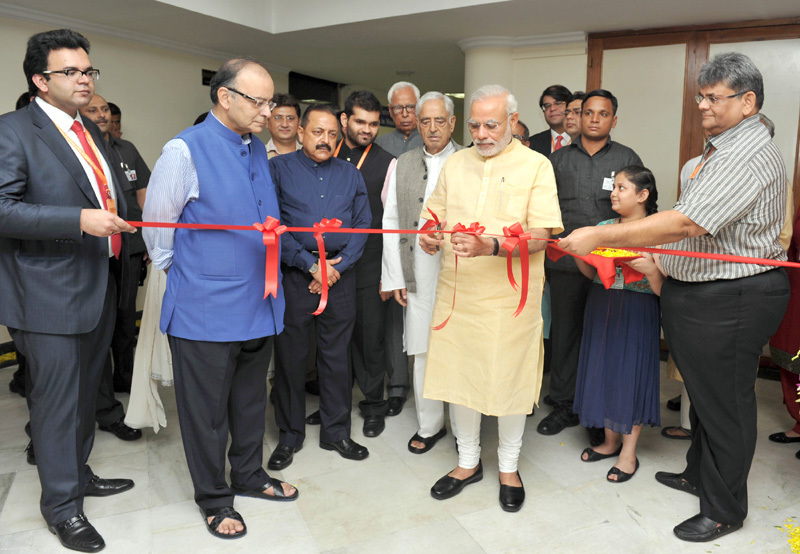 The Prime Minister, Shri Narendra Modi inaugurating an exhibition on Late Shri G.L. Dogra to mark his birth centenary, at Jammu on July 17, 2015. The Governor of Jammu and Kashmir, Shri N.N. Vohra, the Union Minister for Finance, Corporate Affairs and Information & Broadcasting, Shri Arun Jaitley, the Chief Minister of Jammu and Kashmir, Shri Mufti Mohammad Sayeed and the Minister of State for Development of North Eastern Region (I/C), Prime Minister’s Office, Personnel, Public Grievances & Pensions, Department of Atomic Energy, Department of Space, Dr. Jitendra Singh are also seen.